You still can't touch an OUYA. Not until March, at the earliest, and that's only if you're a Kickstarter backer. However, one lucky group of folks already has access: game developers. Those among us who shelled out $700 -- as well as the 10 lucky studios who won that contest -- got an early jump on a pre-rooted OUYA dev kit, while those of us who dropped $95 (or more) are left in the lurch. Of course, those early units aren't exactly the couch-friendly consoles we expect to arrive in a few months, but they are representative of the final hardware. And let's face it -- the OUYA is important. A crowdfunded, extremely inexpensive, open-source game console? That's not exactly the standard (heck, Sony's PlayStation 3 debuted with a $500 baseline). The OUYA is essentially taking the low-cost / high-performance aspect of mobile gaming and moving it into a TV-friendly space, and that concept has even spawned some imitators (the likes of which we'll assuredly see more). But what do we know about actually using the OUYA? Beyond basic specs and a sporadic showering of images, we've never actually touched the thing. With that in mind, we asked a trio of developers who've spent the last month with their dev kits how they feel about the console thus far, and we've compiled their thoughts below. One month out, how does the OUYA dev kit stack up for developers? Let's find out! 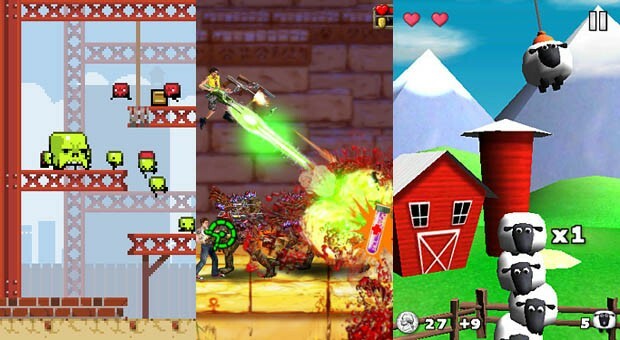 Rami Ismail represents Vlambeer, creators of indie hits Super Crate Box and Luftrauser. Nathan Fouts represents Mommy's Best Games, creators of 2D gems Shoot1UP and Explosionade. 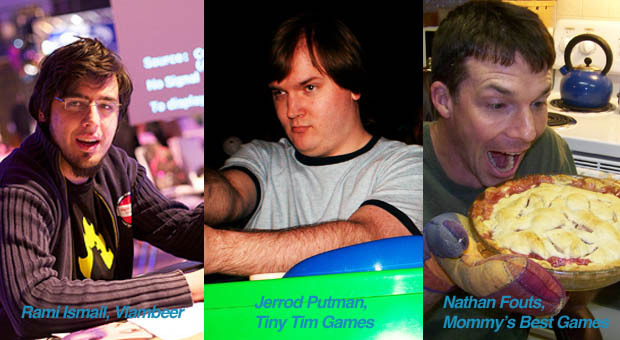 Jerrod Putman represents Tiny Tim Games, creators of animalia-laden titles Sheepstacker and Word Monkey. What are the OUYA's advantages / disadvantages, its greatest strengths and weaknesses thus far? Rami: We've actually been pleasantly surprised. Obviously, what we have is a dev console, so it's not the final version of anything from materials to UI. Considering the kit was on an extremely tight schedule, we are impressed, though -- it's fully functional and the "bugs" they preventively warned for are practically non-existent. Nathan: The OUYA is definitely an exciting piece of hardware as it's positively silly how quickly you can get something running on it. This may be obvious for all Android mobile developers, but coming from a console background, I was really impressed with the accessibility and open aspects of the platform. In fact, the openness of the OUYA is definitely one of its strongest traits. From its ease of development, to how open the marketplace is supposed to be, I think it's a real delight. Getting Serious Sam Double D XXL through XBLA's Certification was brutal! I'm happy to release the game there, but it's a nice break to have fewer restrictions. I think the most interesting, strange part of the hardware is the touch pad. It's tough to integrate sensible uses during action games, such as game genres that you have traditionally designed with a standard controller layout. I think there is room for innovation to be made there, but will take some adjustment. Because switching between buttons and touch pad is tricky, it's probably best used in games where the player has a moment to think first, like a puzzle or strategy-oriented game. Jerrod: One of the reasons why we haven't even attempted releasing something on Android is due to needing to support potentially thousands of devices. 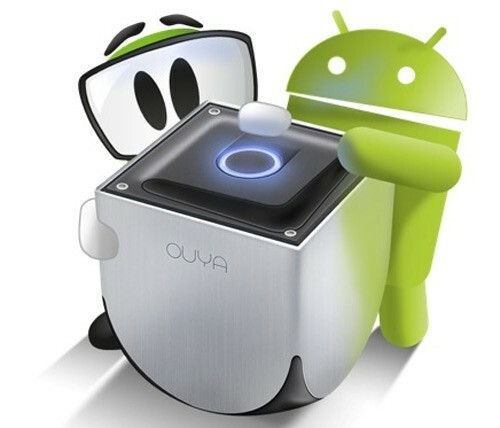 While OUYA is technically "just another Android device," the fact that it's being presented as its own platform (custom marketplace, custom controllers, custom OS services) means that we can target the OUYA hardware specifically without having to also target thousands of other devices. And since it's being presented as a home console instead of a phone or tablet, we can produce games with larger scopes and longer play times than on portable devices. Really the disadvantage of the hardware is the passage of time. The Tegra 3 chipset inside is powerful enough to push a lot of polys around and it can even handle a fair amount of pixel shaders, but there are already mobile chipsets being introduced that will surpass it easily. But this is just par for the course for consoles, and over time developers should be able to push the boundaries of what the chip is able to do. Does it stand to change anything about the way you develop games? Rami: Hooking the OUYA up to the TV is easy. The controllers feel nice (although the triggers and the analog sticks are still getting some rather welcome revisions for the consumer launch, we heard) and setting it up to accept and receive code was remarkably painless. We had "Hello World" on the screen within minutes of turning the OUYA on and we quickly loaded the original Luftrauser and some personal projects onto the console. Surprisingly, they performed well without too much hassle. We tried some "native" Android code, but also Adobe Air and Unity code and it all worked without hassles, which basically means pretty much anyone -- amateur developer or professional team -- could get started making games. Nathan: Hardware-wise, we've not pushed it to its limits much, but we've definitely hit some barriers trying to get thousands of sprites drawn. Still, within days we were able to optimize some drawing routines and see massive boosts thanks to all the available online documentation and tutorials. The machine is clearly not a powerhouse, but it's not a slouch either, and I think there's plenty of room to optimize and improve. Jerrod: Personally, I'm a console gamer, and I started game development in the console industry before moving to iPhone. While mobile games are certainly fun, it's difficult to match the scale of a console game on a mobile device. So for me, it's nice to return to the type of platform where those kinds of games are a better fit. And of course, the fact that the barrier to entry is so low compared to other consoles, it's really the only console [that] truly allows indies (and not just stuck in some sub-category, with access to only a small percentage of the console's power). What do you think about the business potential of releasing games on OUYA? Rami: There are still a few unknowns that will ultimately decide how OUYA pans out. Curation is a big one; too strict risks alienating creative developers and too loose and you end up with a minefield of terrible apps similar to the Android Play Store. Another one is whether OUYA ultimately can convince developers to spend time and resources on making games for the platform long enough for it to grow into a feasible market. The final one is whether the developers are willing and able to create content that uses the strengths of console gaming: games that you can enjoy from the couch, alone or with friends. Nathan: Business-wise, it's all up in the air as to how well the OUYA will treat developers. It's sort of a catch-22; since they have no massive backing (like Sony or Microsoft), it's tough for developers to commit for worry of low gamer numbers. Then there [are] the gamers who may be uncertain if the games will be there. So far the OUYA team has done pretty well, though, reaching out to developers. We were excited enough from the beginning to back the project on Kickstarter for a dev kit. Jerrod: This is really the biggest unknown now. Naturally, we hope it does well, because at the moment, this is the only way we can actually release console games. There was certainly a lot of excitement for the Kickstarter from players and developers alike. But success for the platform can only come from developers making great games specifically targeted at the OUYA, and not just tablet game ports. Since we use the Unity engine, one benefit for us is that since OUYA is built on Android, if things go south we always have the potential to release our games on other platforms. How has it been working with the OUYA folks (did they send you a dev console or did you support the Kickstarter for one)? Rami: We've always had great experiences working with Sony (seriously, they're great to work with as an indie), so we had pretty high expectations. We've had a good experience with OUYA's team, which is something we're really happy about. Talking to Julie [Uhrman] -- the big boss herself -- was quite refreshing too. You got to hand it to her; this isn't the smallest undertaking. Jerrod: They've been very responsive and have been great at responding to our feedback on the developer forums. They've already implemented some controller changes based on our feedback, and we've also worked through the fact that the controller doesn't have a dedicated Start / Pause button. We supported the Kickstarter, and received a dev console through that. Rami: While we were skeptical at first, we guess that the prospect of even relatively obscure developers being able to make amazing games for our TVs is a rather convincing argument to be less skeptical. While we're wrapping up on Luftrausers for PC and Mac and Ridiculous Fishing for iOS -- working long days and nights for the next few weeks -- we don't really have time to properly explore what we're going to do with the OUYA. We're definitely having fun toying around with it. We'll see what we do when we've got those two games under our belt, we guess. Nathan: I'm hopeful for a very smooth production-to-release pipeline and the prospect of tons of fan support. It's all up in the air now, but it's exciting to climb aboard at the start. Jerrod: The OUYA represents a real way for indies to truly join the console world, without needing to sign abusive publisher contracts or compromise on their vision. While the hardware may be underpowered compared to an Xbox 360 or PS3, I fully expect better-than-late-PS2 visuals. And game-wise, the PS2 was no slouch.